A double wall oven offers twice the cooking space as a traditional wall oven, perfect for anyone who does a lot of baking or entertaining. Wall ovens are heavy and it takes a bit of carpentry to prepare the wall cabinet for the weight. 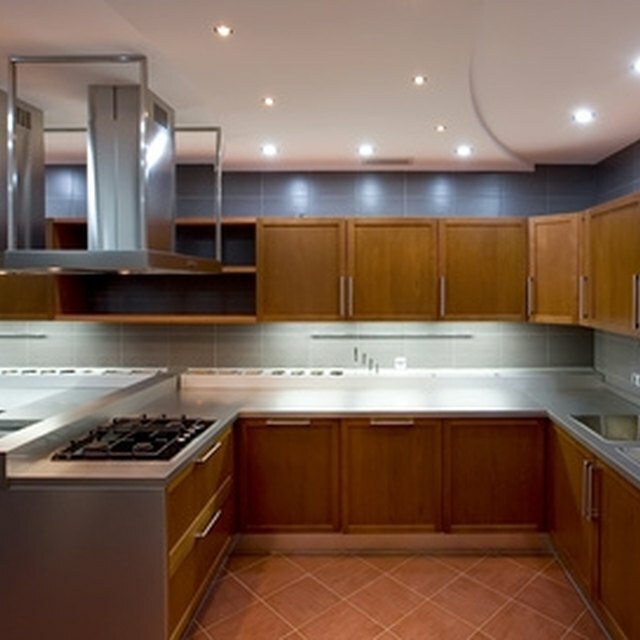 Measure the cabinet's dimensions carefully and check them against the manufacturer's specifications before beginning the installation to ensure the oven will fit. It takes two people to set the oven into the cabinet, so enlist a family member or friend to help. Measure the hole in the face of the cabinet. Cut the hole to the dimensions of the oven with a jig saw if it is smaller than required. Measure the depth of the cabinet. Cut two 2-by-4s at that length. Place one 2-by-4 against the left-inside of the cabinet frame at the height the oven will sit. Place a level on the top of the board and adjust it until the bubble on the level is in the exact center. Secure the board in place with a drill containing a Phillips-head bit and 2 1/2-inch wood screws. Place the second 2-by-4 directly across from the first. Set the level on the front edge of each 2-by-4 to ensure they are level with one another, then set the level on the edge of the board and adjust it until it is level from front to rear. Secure the board with 2 1/2-inch wood screws. Remove the doors, racks and anything else that can reduce the weight of the oven. Carefully lift the oven and set it in place on the 2-by-4s. Connect the gas and electrical connections according to the manufacturer's specifications. Turn off the power at the circuit breaker box if the electrical connection requires any wire splicing. Replace the doors, racks and anything else that was removed before installation. Double- and triple-check for gas leaks if you are installing a gas oven. Even the smallest gas leak can cause a fire. You can never be too careful. What Do I Do If I Bought a Self-cleaning Oven is Smaller Than the Hole It Goes In?